Under General Francisco Franco, Spain like other countries of Western Europe, declined to participate in the U.S.-inspired October 1960 embargo of Cuba. Indeed, the Spanish caudillo kept Iberian Airlines, the state run flagship carrier, flying as the only direct link between Cuba and Western Europe. From the late Franco era to the present, Spain’s economic relations with Cuba have been manifested by a growing merchandise trade, official credits and in the 1990s direct investment by Spanish firms in the island’s economy. This paper examines Spain’s economic initiatives toward Cuba in the context of three strategic factors. These factors include the Iberian nation’s recent salience as a prosperous market economy; Spain’s policy toward the “Nations of its Historical Community”; and Spain’s role within the European Union (EU) as an effective advocate for its former New World colonies and Brazil. The last section focuses on Spanish-Cuban economic relations since Fidel Castro’s enactment in 1990 of the “Special Period in Time of Peace”—and assesses Spain’s crucial role as supplier of goods, provider of credits and premier foreign developer of the island’s tourism industry. The paper does not discuss the Spanish-U.S. dimension. Spain’s official response to the 1992 Torricelli and 1996 Helms-Burton laws have been covered at length by Joaquín Roy (1996, 2000), George Lambie (1996) and others. Within 18 months of his death in November 1975, the political edifice erected by General Francisco Franco found itself being carefully dismantled under the cautious management of King Juan Carlos. Nevertheless, it is important to keep in mind that, before this momentous political transformation took place, Spain had experienced an extended period of accelerated economic growth and structural change. As a result, the Iberian nation was able to cross the arbitrary threshold that separated “less developed” countries from those with “industrial market” economies in a relatively short period of time (Baklanoff, 1978 and 1985). During the late 1950s, Spain shared certain characteristics common to the less developed, semi-industrialized nations of Mediterranean Europe and Latin America: a relatively low per capita income, a predominance of unskilled workers, a large fraction of the labor force in agriculture, comparative technological backwardness, and an export profile dominated by primary commodities. In 1958, Spain’s per capita output (GDP) of $324 was higher than that of Mexico ($255), Brazil ($252), and Portugal ($212), but ranked below that of Cuba ($379), Argentina ($476), and Venezuela ($715) (United Nations, 1963: 315-317). Crucial to Spain’s economic “opening” was the fact that, beginning in 1958, a reorganization of the cabinet got underway which brought into prominence a new group of ministers whose vision of Spain’s future was in sharp contrast to that of the semi-fascist Falange (Lewis, 1972). Broadly Europeanist in their attitudes and committed to the market economy, this group of younger men took command of key economic ministries. It was due to their influence that Spain became a member of the World Bank and the International Monetary Fund (IMF) in 1958. In the spring of 1959, the eruption of a major foreign exchange crisis served to strengthen the hand of these new cabinet ministers who sought to end the country’s economic isolation, and they were able to prevail upon Franco to accept the conditions set by the international creditors. As a result, in July 1959, the Spanish government drew up a stabilization program designed to bring the nation’s domestic and international transactions into equilibrium. Subsequently, the new policymakers liberalized international trade, promoted tourism, actively sought (and received) official external credits, and, all in all, provided conditions favorable for attracting foreign direct investment. From 1959-60 (when the new development strategy was adopted) to 1972-73, Spain’s real gross national product (GNP) grew at an annual rate of 7.3%, a figure that was exceeded only by Japan and Greece among the then-24 member countries of the OECD. In 1974, the Spanish economy had changed markedly from its situation in 1960. Total production was 2.8 times greater, in real terms, than it had been 14 years earlier; industrial production expanded nearly fourfold; the output of services was nearly 2.7 times greater. During the period of accelerated growth, the Spanish economy converged with the future 12- country European Community (EC). In 1960, Spain’s per capita GNP (at current market prices and purchasing power parity exchange rates) was just under 60% of the EC-12 average; in 1975, at the end of the Franco period, the country’s per capita GNP had risen to 81% of the EC average (European Commission, 1991, p. 229). By 1974, Spain had assumed a commanding lead over Latin America, as reflected in per capita GNP and other indicators. The Iberian country had developed into a significant exporter of manufactured goods, had acquired a respectable national market, and had become a new source of foreign direct investment, credits, and technology for Latin America. Because of Spain’s recently achieved economic strength as a middle industrial power, it has been able to substitute what historian Fredrick Pike calls “practical” hispanismo for “lyrical” hispanismo (Pike, 1986, p. 69) to make good on its quest for a special relationship with its former colonies and with Brazil. In the trade relationship between Spain and Latin America, each partner strongly emphasized its comparative advantage vis-à-vis the other. As an example, in 1979 manufactured goods constituted 91% of Spain’s exports to Latin America, whereas 90% of the region’s exports to Spain were of primary commodities covering just three major groups: foodstuffs (41% of the total), fuels (26%), and agricultural raw materials (18%) (ICI, 1982, p. 50). Latin America provided more than a quarter of Spain’s total imports of primary commodities. Given its economic lead over Latin America, Spain soon emerged as a creditor- lender to its former colonies and Brazil (Baklanoff, 1985). Since its accession to the European Union in 1986, Spain has experienced a second economic transformation. Together with its Portuguese neighbor, Spain has been greatly affected by its integration into the single European market and its membership in the 12-country European Monetary Union (EMU). The Iberian nation’s economic growth rate since 1986 has exceeded the EU average; consequently, the per capita income gap between Spain and its European partners has continued to narrow. In his numerous state visits to Latin American countries, King Juan Carlos has emphasized Spain’s newly- achieved prosperity, which combined with its “progressive ideals,” would enable his country to offer the region economic and technological cooperation (Pike, 1986, p.88). Furthermore, seen from Latin America, Spain’s dual political and economic transformation offers a model worthy of consideration: it has three characteristics which make it the best possible reference for the region—“recent, similar, and successful” (Herrán, 1999, p. 82). Capitalizing on their linguistic-cultural affinities, Spanish investors have become bold new players in the Latin American countries. Large Spanish enterprises, many of them only recently privatized, have been reinventing themselves as multinationals with their core overseas operations in Latin America. Direct investment by Spanish firms in the region (including acquisitions) reached nearly $50 billion in 1997-99, the three years of most intensive activity (Ministerio de Economía, 2000). At the beginning of the year 2000, Spain was second only to the United States in accumulated direct investment in the region and had overtaken the U.S. as the largest investor in Argentina and Chile (Wall Street Journal, January 25, 2000, p. A10). Among multinational entities, Spanish enterprises also dominated Latin America’s banking, telecommunications and electricity industries. As Chief of State and the symbol of its unity and permanence, the King shall moderate the regular functioning of its institutions and assume the highest representation of the Spanish State in international relations, particularly with the nations of its historical community (Tovias, 1990, p. 60). Significantly, the term “its historical community” refers both to Europe and Latin America. To implement its special relationship with its former colonies in the New World, in 1985, Spain created the Secretariat of State for International Cooperation and for Iberoamerica as one of the three divisions of the Spanish Foreign Ministry, alongside the Secretariat of State of the European Communities and the General Secretariat of Foreign Policy (Tovias, 1990, pp 60-61). Beyond Europeanization and the special relationship with Latin America, Spain’s foreign policy had also been influenced by what Mujal-León calls “latent anti-Americanism” (Mujal-León, 1983, p. 103). Ever since the Spanish-American War of 1898, there have been elements of Spanish officialdom that have harbored a lingering resentment of the fact that, as Hennessy has observed, “the final coup de grace to Spain’s world empire was delivered by the United States (Hennessy, 1986, pp. 369-370). Also, as Mujal-León further notes, because of the Francoist victory during the Spanish Civil War, Spain and the United States did not share the experience of World War II or the postwar reconstruction period so instrumental in cementing the Atlantic Alliance (Mujal-León, 1983, pp. 104-105). Actuar en Cuba, además de las razones humanitarias legítimas y las comprensibles motivaciones económicas, tiene el irresistible ingrediente de algo que no cuadra en el esquema mental de los norteamericanos. Desde 1898 la España official y la real han esperado con mal disimulada frustración una oportunided para pasarle la factura a los Estados Unidos (Roy, 1996, p. 21). Even as U.S.-Cuban economic relations intensified following the island’s independence, thousands of Spaniards migrated to Cuba during the first quarter of the twentieth century. Significantly, these newlynaturalized Cuban citizens and their immediate offspring contributed disproportionately to the new nation’s stock of human resources. A natural outcome of this Hispanic immigration was the españolización of Cuban society (Roy, 1996, p. 4). In January 1960 the new revolutionary regime in Havana expelled the Spanish Ambassador to Cuba for suspected collaboration with “counter-revolutionaries.” Later that year, after serious disagreements with the hierarchy of the Cuban Catholic Church, the regime expelled over 100 Spanish clergy (Lambie, 1998, pp. 11-12). On the economic front, the Castro regime expropriated Spanish direct investments without compensation. During the formative stage of the Cuban Revolution the “very special” relationship between Spain and the Caribbean nation was played out on a very personal level between Franco and Castro despite their ideological differences—a theme developed in Georgie Anne Geyer’s 1991 book, Guerilla Prince: The Untold Story of Fidel Castro (Geyer 1991). Geyer emphasizes the mutual admiration between the two dictators, both with roots in the Spanish province of Galicia. Franco admired Castro’s anti-Americanism, and Castro in turn declared a national week of mourning after the generalissimo’s death in November 1975 (Horowitz, 1991, p. 35). During his visit to Havana in November 1986, Prime Minister Felipe González reached an agreement with Fidel Castro in which the Cuban government promised to pay $400 million to indemnify Spanish investors for their expropriated assets (Spain ‘86, December 1986, p. 3). Although the agreement specified a 15-year compensation schedule, Cuba’s payments have since fallen in arrears. Under the center-right government of Prime Minister José María Aznar, Spain independently put forward a proposal for a common EU position on Cuba in November 1996, which reflected its new hard line toward Havana (Lambie, 1996, p. 63). One of the most controversial elements of the Spanish proposal included the recommendation that every European diplomat in Havana should establish contacts with dissidents, and that all Cubans be given freedom to travel abroad (Lambie, 1998, pp. 30-31). Notwithstanding the EU’s rejection of this and other controversial elements of the proposal, the new European “Common Position” on Cuba linked any future cooperation agreement with the Castro regime on progress toward pluralist democracy. Havana’s reaction to the hardline Spanish proposal was hostile and swift: on November 25, 1996 the Cuban government declared its refusal to accept Spain’s designated ambassador, José Coderch, who was scheduled to assume his post in December. To affirm its commitment to the Quinto Centenario (Quincentennial), Spain pledged $20 billion in support of economic, scientific, and cultural assistance to the Latin American countries that participated. This commitment was manifested by an impressive variety of undertakings (Yañez, 1991). Among the EU member countries, only Spain, which channels more than half of its total aid to Latin America, can be said to put the region first in its development assistance priorities (Freres 2000, p. 71). Significantly, the Quinto Centenario celebration served as a point of departure for Spain’s long-term objective in Latin America: the creation of an Iberoamerican Community of Nations. Membership in the community is comprehensive, including not only Spain and its former American colonies, but Brazil, Haiti, and Portugal as well. The momentum associated with the decade-long multinational commemoration helped to institutionalize the incipient community whose first cumbre (summit meeting) was hosted by Mexico in July 1991. The delegates met to discuss the region’s future as a part of a permanent Iberoamerican Community, with strengthened economic ties and a more prominent role in world affairs (Klein, 1992, p. 30). Against the backdrop of the Quincentennial celebration (which coincided with the Barcelona Olympics and the Expo ’92 fair in Seville), Madrid hosted the second cumbre of Iberoamerican heads of state in July 1992. Both King Juan Carlos and the Spanish prime minister attended the ninth Ibero-American Summit in Havana in November 1999. The tenth cumbre, held in Panama in November 2000, was notable for Cuba’s refusal to sign a summit resolution condemning terrorist activities of the Basque separatist group ETA. According to Cuba’s vice minister of foreign relations, Pedro Núñez, the violence in Spain derived equally from government action as from the ETA (El País, November 18, 2000, p. 6). At the first Iberoamerican Summit in Mexico, then Spanish Prime Minister Felipe González committed himself to strengthening, directly or indirectly, his nation’s Latin American policy. His statement clearly reflected Spain’s dual-track approach to the region. The Quinto Centenario and Iberoamerican Community illustrate the direct, or bilateral, approach. Spain’s indirect (or catalytic) role, as the next section demonstrates, helped reshape the European Union’s strategy toward Latin America. Without Spain, as Ambassador Angel Viñas has made clear, “it is unlikely that this strategy could have been adopted or carried out with such firmness under the prevailing difficult circumstances” (Viñas, 1992, p.14). Europeanization, i.e., full membership in the European Union, has been Spain’s premier foreign policy objective since the late Franco period. The Spanish government began to negotiate for membership in the body in 1964 and signed a preferential trade agreement with the EU in 1970. In 1977, both Spain and Portugal made formal application for membership in the EU and finally were accorded full Union status on 1 January 1986. Although Spain had hopes of seeing the same tradeand- aid privileges enjoyed by the former colonies of Britain, France, Belgium and the Netherlands extended to its former colonies in Latin America, it was forced initially to abandon these designs due to the unwillingness of its fellow EU members to agree to such a proposal. Indeed, in 1985, the European Council of Ministers ruled that Spain, upon its admission to full membership, would have to renounce all trade agreements previously concluded with third nations, including those in Latin America. As a latecomer to the European Union, Spain was in no position to lay down conditions that would benefit its transatlantic offspring. As one writer aptly put it, Spain was forced to sign a “pre-nuptial agreement” in a demanding new marriage from which Latin America would be excluded (Riding, 1989, pp. 32-33). This agreement highlights Spain’s overlapping, at times even conflicting, allegiances to both Europe and Latin America. As a fledgling member of the European Union, Spain had to conform to the acquis communitaire, the body of EU law and regulations. In particular, membership required fundamental changes in the Iberian country’s commercial policies (Baklanoff, 1986, pp. 36-45). Several of these policies have had detrimental repercussions upon Latin American exports to Spain. First, Spain had to adopt the EU’s Common Agricultural Policy (CAP), a basic integration instrument of the Union since 1962. The CAP is based on the principles of common pricing (i.e., levies on agricultural imports to raise their price to the level of EU-produced commodities), EU preference, and common financing. Agricultural products of which Spain is a net importer, particularly cereals and meat, have increasingly been supplied by member countries of the EU as the expense of lower-cost producers in the temperate zone of South America, as well as those in the United States, Australia, and New Zealand. Second, the accession agreement required that Spain join the Lomé Convention with the then-65 African, Caribbean, and Pacific (ACP) countries. The existence of a preferential agreement between the EU and the ACP countries (the non-Hispanic former colonies of European members) also served to divert Spain’s imports of tropical products away from its former suppliers, traditionally in Latin America, in favor of suppliers from the ACP countries. Spain’s accession to the EU therefore resulted in both trade deflection and trade diversion at Latin America’s expense. Realignment in the direction of Spain’s trade associated with its EU membership has been dramatic. Notwithstanding rising prosperity in both Spain and Latin America, Spain’s import share from the region collapsed; falling from over 11% in 1985, on the eve of its accession to the EU, to 3.4% in 1999 (IMF, 1992 and 2000). In that year Spain’s trade turnover (exports plus imports) with neighboring Portugal exceeded its trade with the region! • The EU acquired permanent observer status at the OAS, and mechanisms for cooperation with the Inter-American Development Bank (IDB) were established (Viñas, 1992, pp. 11-14). • In November 1990 the EU granted tariff treatment similar to that given the ACP and Mediterranean countries to four Andean countries: Bolivia, Colombia, Ecuador, and Peru. In December 1991, the EU granted similar treatment to the Central American countries plus Panama (Bataller, 1994). • In 1995 the European Commission began negotiations with MERCOSUR (Mercado Común del Sur), the newly-formed customs union comprising Argentina, Brazil, Paraguay, and Uruguay, with Chile and Bolivia as associate members, to build a trans-Atlantic free-trade zone. • In November 1999 the Spanish government approved the launching of a new Latin American securities market within the Madrid Stock Exchange (The Federation of European Stock Exchanges, 1999, pp. 22-23). The new regional securities market could consolidate Madrid’s position as the leading Spanish-speaking financial center. • In 1998 the EU granted Cuba “observer status” in the ACP. Responding to Spain’s hardened policy toward Havana, the EU Commission subsequently ruled that Cuba would have to make substantial progress on “human rights, good governance and political freedom” before gaining full membership in the expanded 71-member ACP group of nations. In April 2000 the Cuban government decided to terminate negotiations on the new Lomé accord declaring that “Cuba does not accept any conditions” (Roque, 2000, p. A17). • In November 1999 the EU and Mexico reached a comprehensive Free Trade Agreement that will eliminate all tariffs on their bilateral trade in industrial goods by 2007. This trans-Atlantic accord, which will put the EU on equal terms with NAFTA, also covers services trade, public procurement, intellectual property rights and adjudication of disputes (Banamex-Accival, 1999, p. 470). As a result of the agreement, Mexico anticipates a large inflow of European investment. After having virtually no formal or institutionalized links in the mid-1980s, the EU ten years later found itself with a network of ties and agreements spanning every aspect of political and economic cooperation with Latin America (Piening, 1997, p. 137). “This is a great country if you are a foreigner” (Quotation from a Cuban youth cited in “The Holdout,” The Wall Street Journal, August 27, 1991, p. A6). Following President Castro’s enactment of a Special Period in 1990, Cuba has witnessed a profound realignment in its trade relationship. In 1989, the Caribbean island conducted 85% of its merchandise trade with the USSR and the other countries that participated in the CMEA, the Soviet bloc trade organization. In 1999 Cuba’s leading trading partners were the high-income market economies of the European Union and Canada. Russia, the largest Soviet successor state, continues to buy some Cuban sugar but offers little in exchange to the island economy. As Table 1 shows, Spain’s merchandise exports to Cuba rose sharply from under $300 million a year on average in 1990-91 to over $620 million a year in 1998-99. By contrast, Spain’s much smaller imports from the island grew at a slower pace resulting in a widening trade gap between the two countries during the decade. Spain’s exports to Cuba for the decade totaled $3.8 billion while its imports amounted to only $987 million. This virtual four to one ratio of exports to imports left Cuba with a decade-long bilateral deficit of nearly $2.9 billion. Toward the end of this period, in 1998-99, Cuba ranked fourth among recipients of Spain’s exports in Latin America behind the much larger economies of Brazil, Mexico and Argentina, respectively. During this two-year period Spain supplied 20% of Cuba’s imports and accounted for 30% of Cuba’s large global trade deficit. Cuba’s growing trade deficit with Spain during the Special Period represented continuation of a trend already evident in the previous decade. As Spain became increasingly self-sufficient in sugar production toward the end of the 1970s, its trade balance with Cuba moved strongly against the latter country. Cuba’s principal exports to Spain moved in the direction of tobacco, nickel and shellfish—commodities that are unaffected by the EU’s commercial policy regime. During the 1980s, Spain’s most important export to Cuba was ships, with Iberian shipyards building a major share of the island’s modern fishing fleet. In 1984, the state-owned shipyards Astilleros Españoles concluded an agreement to build eight 15,000-ton cargo ships which the Spanish government’s industrial credit bank financed with payment stretched over 10 years (Hennessy, 1986, p. 365). Spain also exported to Cuba buses and trucks that were built by the state-owned Pegasso factories. 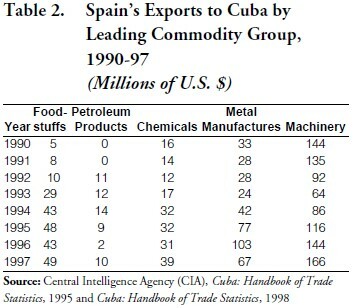 The composition of Spanish exports to Cuba was heavily weighted toward industrial products, chiefly machinery, metal manufactures and chemicals— with foodstuffs gaining in importance from the mid- 1990s (Table 2). 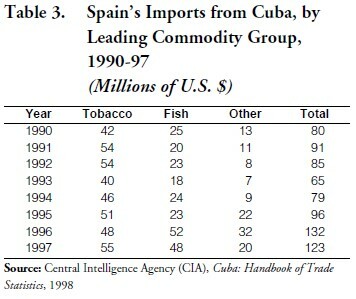 Tobacco and shellfish dominated Cuba’s exports to Spain in the 1990-97 period (Table 3). The net revenues of Spanish tourism enterprises operating in the island partially offset Cuba’s growing annual trade shortfall with Spain during the Special Period. Spanish direct investment, though modest in scale, also contributed marginally to offsetting the trade shortfall. Because of Cuba’s large global trade deficit (with the notable exception of the Russian and Netherlands surpluses), it would appear that multilateral clearing operations could not have offset Cuba’s merchandise deficit with Spain. A significant component of Cuba’s bilateral trade shortfall with Spain during the 1990s must therefore have been financed by official agencies of the Spanish government such as the Fondo de Ayuda al Desarrollo (Roy, 1996, pp. 17-18). Cuba’s hard currency debt as of 1998 reached $11.2 billion according to the Cuban central bank (El Nuevo Herald). Of that sum, the Cuban government owed Spain 10.8%, or $1.2 billion. In a dramatic reversal, Venezuela replaced Spain as Cuba’s leading trading partner in 2000 (“The Americas,” Wall Street Journal, February 17, 2001, p. 17). Hugo Chávez, the populist Venezuelan leader, has agreed to supply Cuba with one-third of its oil needs at discount prices which the cash-starved island can partially repay in services (Olmstead, 2001, p. 38). To arrest Cuba’s deep economic contraction following the collapse of the Soviet Union, the Marxist-Leninist regime opened up Cuba to foreign direct investment and to foreign visitors. The “rules of the game” under which Spanish and other foreign investors participate in Cuba differ greatly from those that apply in other Latin American countries. First, foreigners are required to enter into joint ventures with the Cuban government. Following Cuba’s economic crisis of the early 1990s the socialist economy has been substantially militarized: high-ranking officers of the Fuerzas Armadas Revolucionarias (Revolutionary Armed Forces-FAR) have been given direct control of major segments of the state-owned economy (Amuchástegui 2000 and Mastrapa 2000). These include sugar production, mining and oil exploration, foreign trade, transport, communications, the merchant marine and ports, fisheries and the resurgent and lucrative tourist industry. Second, foreign investors are attracted by a moderate tax regime that permits duty-free imports of equipment and raw materials, free remittance of profits and no capital gains on the liquidation of the investment. Foreign executives operating in Cuba are exempt from taxation of their income. Third, foreign companies are not permitted to hire workers directly. Instead they must contract with a state agency, ACOREC, which—in the absence of independent unions—guarantees a docile and disciplined labor force. Foreign companies can and do fire any employee without justification (Pax Christi). The foreign partner in the joint venture must pay the wages of its employees in US dollars to ACOREC, which then pays the employees in pesos at the official fictitious exchange rate. This arrangement allows the government to retain between 95-96% of the employee’s real wage. Fourth, ordinary Cuban citizens do not enjoy property rights. They may not own or accumulate capital assets, engage in foreign trade or participate in joint ventures with foreigners. Reliable figures on foreign investment in Cuba are hard to obtain. The U.S. Department of State reported that an estimated $1,767 million was invested in Cuba between 1990 and March 1999 (US-Cuba Trade and Economic Council, 2001). As of that date, the largest industries receiving foreign investment were reported to be telecommunications with $650 million, mining with $350 million and tourism with $200 million. These figures represent the dollar amounts “committed and delivered.” Among country sources, Canadian investment led with $600 million, followed by Mexico ($450 million), Italy ($387 million) and Spain ($100 million)—in distant fourth place. The stock of foreign direct investment in the island reached the $5 billion mark in the year 2000, according to Marta Lomas, Cuba’s minister of foreign investment (Latin American Monitor: Caribbean, May 2001). Obviously, the wide disparity between the minister’s figure and the State Department estimate begs for explanation. Lomas indicated that the year 2000 saw the signing of 31 new joint venture and association agreements in branches as diverse as cement production, industrial gas, oil exploration and fishing. The main national sources were Spain, Canada, Germany, France, Norway and Brazil. The modest figure for Spanish direct investment in Cuba cited in the State Department estimate would appear to be quite reliable. According to the Spanish Ministry of Economy (Ministerio de Economía), the gross flow of Spanish direct investment to Cuba during the period 1997-99 amounted to only 10,261 pesetas (about $68 million). Significantly, this three year flow ranked below Spanish investment in the relatively poor countries of Guatemala, Dominican Republic and El Salvador. Although favoring tourism, Spanish investments in Cuba also include tobacco products and oil exploration. Led by the Sol Meliá group, Spanish hotel chains such as Guitart Hotels, Iberostar and Iberian Travel dominate foreign participation in Cuba’s burgeoning tourism industry. The Spanish and other foreign chains operate in joint ventures with the Cuban government and through management contracts, both of which provide the Cuban partner with improved quality control and foreign market access. Tourism has become the island’s most important hard currency earner, surpassing sugar, nickel and tobacco exports. Tourism minister Ibrahim Ferradaz noted that over the decade the number of hotel room tripled, the number of visitors increased five-fold and the dollar earnings in 2000 were eight times higher than in 1990 (Latin American Monitor: Caribbean, July 2001, p. 8). Tourist arrivals in 2000 totaled 1,774,000 and the industry directly employed 100,000 Cubans that year. Despite its impressive growth, Cuba’s tourism industry has its problems. Ferradaz reported the industry’s net revenues in 1999 at only 25 cents out of every dollar flowing to Cuba (Financial Times, April 2000, p. 3). Because of the low degree of backward linkage to the island, Cuban tourism is burdened with a huge import requirement as well as the foreign exchange cost of capital investment: profits, interest, royalties and management fees. Sol Meliá, the main player in Cuban tourism, coowned or managed 20 hotels in Havana and other coastal resorts as of July 2001 and plans to double that number in the next decade (Granma Internacional, July 4, 2001). A study of Sol Meliá’s global operations concludes “Cuba has been consistently the most profitable market during the last years” (Blanco Godínez, 1999, p. 53). As an example, in 1996 the Cuban Division of the giant multinational company accounted for nearly 10% of total revenues with only 3.9% of its global holdings (Blanco Godínez, p. 55). Repsol-YFF, the Spanish-Argentine oil and energy company, has entered into agreements with the Cuban state-owned Cupet, to jointly study energy opportunities in the Caribbean island (Wall Street Journal, December 14, 2000, p. A22). Signed at the end of 2000, these agreements include exploration, production, refining and marketing of oil products, as well as development of natural gas and production of electricity. The two companies will also undertake oil-exploration studies in deep waters northwest of Cuba, in the Gulf of Mexico. Spain’s economic initiatives toward Cuba should be viewed in the perspective of the Iberian nation’s successful transformation from economic backwardness to prosperity. In the words of King Juan Carlos, because of Spain’s recent salience as a middle industrial power, it has been able to undertake a “secular American mission” (Pike, 1988, p. 88) in the nations of its historical community. After the European Union (EU), Latin America has been the most important focus of resurgent Spain’s foreign relations, as codified in the 1978 Constitution. All Spanish political parties and the foreign policy elite alike acknowledge this special relationship between Spain and its former American colonies. The 1992 Quinto Centenario commemoration lent momentum to, and served as a bridge toward, the creation of the Iberoamerican Community of Nations—a Spanish objective of long standing. Despite the many humiliations that Fidel Castro has visited upon Spain, Cuba has been included in the annual Iberoamerican Community Summit meetings. Spain’s “very special” relationship with Cuba, its last colony in the New World, is based on powerful historical and latter-day kinship affinities. Moreover Spanish policy toward Cuba also has been influenced by what Mujal-León calls “latent anti-Americanism.” By circumventing the U.S. embargo through diplomatic and economic engagement with Cuba, Spain could “even the score” (at least symbolically) with the United States for the 1898 desastre. 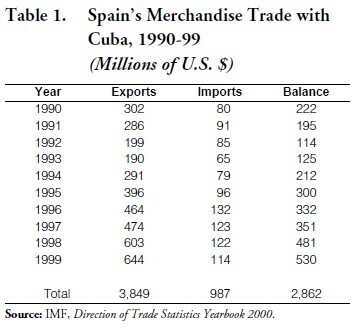 Merchandise trade between Spain and Cuba expanded rapidly during the 1990s. Toward the end of that decade Cuba had become a respectable market for Spanish industrial exports when the Iberian nation accounted for about one-fifth of the island’s imports and nearly one-third of its large global trade deficit. Capitalizing on their linguistic-cultural advantages, Spanish enterprises, many of them only recently privatized, have been reinventing themselves as multinationals with their core operations in Latin America. In Cuba, Spanish investments have gone mainly into the Caribbean island’s burgeoning tourism industry, which they have come to dominate. Led by the Sol Meliá group, Spanish hotel chains operate in Cuba through joint ventures with the government and through management contracts. The latter, especially, provide the Cuban partner with improved quality control and market access while economizing on Spanish company risk exposure through equity participation. The “rules of the game” under which Spanish and other foreign investors participate in Cuba appear to be heavily biased against their Cuban employees while empowering the ruling elite-high-ranking members of the monolithic Communist Party and the Revolutionary Armed Forces. If Cuba has a fundamental change in government and revival of independent labor unions, could the foreign companies be held legally responsible for their complicity in these biased arrangements? Since its accession to the European Union in 1986, Spain’s growing effectiveness as the good advocate for its former New World colonies and Brazil has been instrumental in shifting the EU’s Latin American policy from one of benign neglect toward active engagement. With respect to Cuba, the Europeans (as well as the Canadians) missed the opportunity jointly to use their initial bargaining power with the Castro regime to secure economic rights for ordinary Cuban citizens. The EU policy of unconditional commercial engagement with the Caribbean nation failed to overcome Fidel Castro’s intransigence regarding human rights and may have prolonged the longevity of his regime. The center-right government of Prime Minister José María Aznar (1996- ) influenced the design of the EU “Common Position” on Cuba. Incorporating Spain’s new hardline toward the Marxist-Leninist regime, the common position links any future cooperation agreement with Cuba on progress toward pluralist democracy. Consequently Havana was unable to accept the EU’s conditions for Cuban inclusion in an expanded ACP membership under the 2000 Lomé agreement.